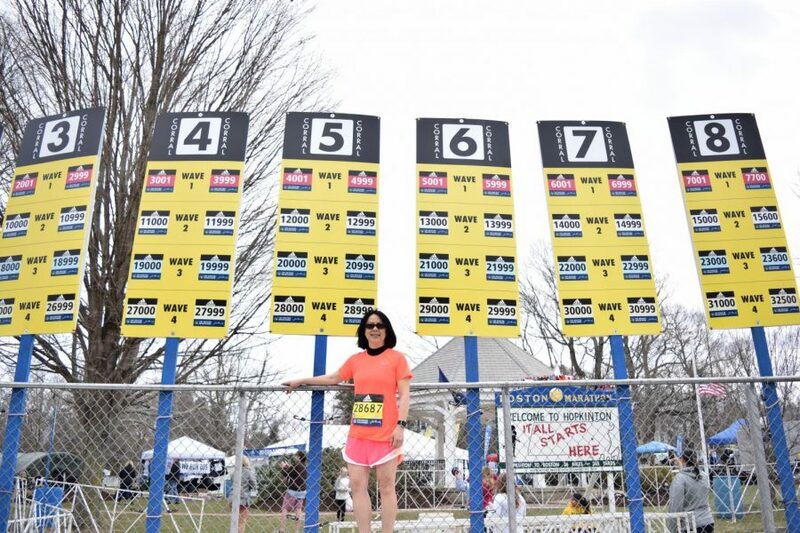 My mom, Denise Antaki, won one of Hopkinton’s 50 invitational bibs for the Boston Marathon back in December 2017. This year, the marathon will be taking place on April 16th. She is running to raise money for my class, the Class of 2018. Yet, unlike many others who decide to run a marathon, my mom has only run 5Ks, and nothing beyond that. For this reason, she is not what I would call an “avid runner,” someone who runs most days of the week for fun. My mom is more of a casual runner, who runs when she feels like it. “I’m not a serious runner. I’ve only run 5K races in the past and nothing above that. So, the 26.2 miles is a bit of a challenge” my mom said. So what does it take to go from a few 5Ks to a marathon? Well – a lot. drawing for my class’s bib. Denise Antaki is given the Class of 2018 marathon bib. There is a very limited number of bibs available for the Boston Marathon, especially with the growing number of applicants each year. To get into the Boston Marathon, runners either have to qualify or raise money for a charity. For my mom, considering her age and gender, qualifying would mean she would have had to run a past marathon in 3 hours, 26 minutes, 37 seconds. Breaking even four hours is difficult. Considering she is not a huge runner, qualifying for Boston was out of the picture. However, receiving a charity bib is also difficult. According to the Boston Athletic Association (BAA – the organization who orchestrates the Boston Marathon), only 2,585 of the 30,000 total bibs are distributed among charities. Even then, these charities have many applicants competing for their bibs. So when the opportunity came up to run Boston for the Class of 2018, my mom jumped on it. “It was kind of a spur of the moment. I didn’t plan to seek out an invitational bib,” my mom said. 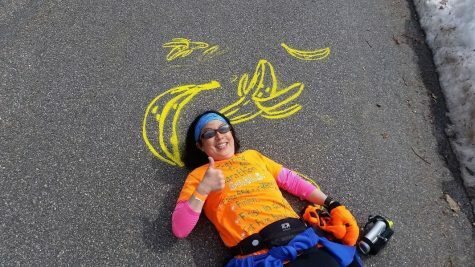 She figured that since we have lived in Hopkinton since 1995 (22 years) and have been around the marathon for so long—watching it grow over time—why not run it. My mom started training right after she was awarded the bib in late December and will train for a total of four months. My dad, who considers himself an avid runner, has been helping her train and has run with her five or six times. But for the most part, my mom has been training on her own. She is using the Hal Higdon novice marathon training schedule. Hal Higdon is a well known American runner and writer who has run eight times in the United States Olympic Trials and won four World Masters Championships. He has created numerous training plans for different races and different skill levels. His novice marathon schedule consists of running every Tuesday, Wednesday, and Thursday, and then a long run on Saturdays, upping the mileage each week of the schedule. Denise Antaki training late at night. Though my mom’s training is not exactly consistent, she said she has picked the pace up since February. This included a long run from 9:30 PM until 12:45 AM following the Hopkinton Girls Basketball win on March 3rd, where she was fundraising. On Saturday, March 24th, she ran her 20-mile long run. Long runs are training days leading up to a race that consists of running close to the distance of the actual race. 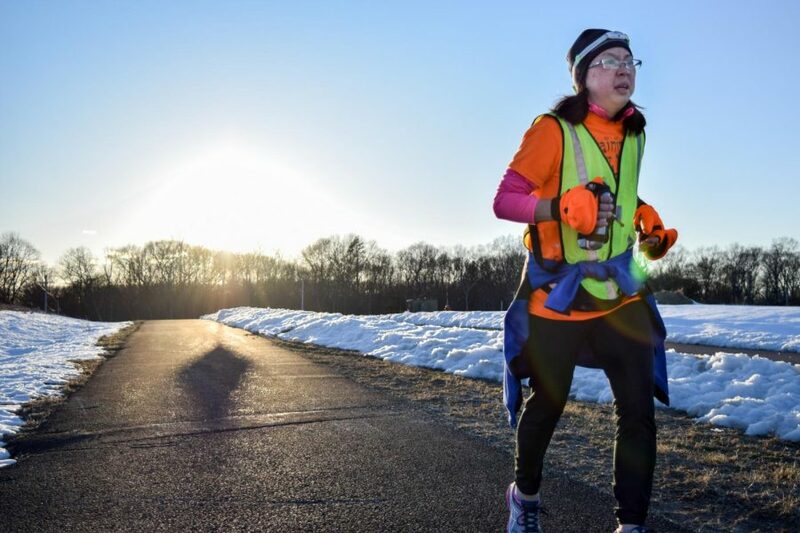 She ran 20 miles along the route, which took her to Heartbreak Hill, an ascent late in the course known to be notoriously difficult. That will be her longest run before Marathon Monday. My dad is an Internal Medicine Physician and had a lot of insight to share. So when reading the medical advice throughout the rest of this article, it is not just coming from my dad, but a medical professional. When marathon runners do long runs, they are training their body to be on its feet for a continuous period of time. “As important as cardiovascular fitness is, you’re also getting the bones and muscles ready to be upright and pounding for a prolonged period of time,” my dad said. Nikolai Markovich ran the Boston Marathon for the Class of 2018 last year and shared what his training was like. “When I trained for Boston, I was running six days a week, and I was averaging around mid-fifties [miles per week] for quite a few weeks,” Markovich said. Unlike my mom, who is going from a 5K to a marathon, Markovich worked his way up to a marathon. He started long distance running in 2014 with a 5K, then a four-mile race, then a half marathon, and then his first marathon, the Maine Coast Marathon, in 2015. Training for Boston is particularly difficult because runners have to train through the winter. It takes more time to plan clothing because runners cannot just throw on shorts and a t-shirt. Runners who train for Boston do not know what mother nature will present and temperatures can fluctuate. A 65-degree day may seem like the perfect weather for spectators, but for runners, that temperature is uncomfortably warm. Joshua Hanna, the assistant principal at Hopkinton High School, ran the Boston Marathon in 1997 when he was in college. His training also took place in Hopkinton. He started training in late December and continued up until the marathon. Training is not only about working the legs and lungs, but also other muscle groups so that the entire body is fit. Denise Antaki visiting the local butcher’s shop on one of here training runs. “If you just train by running too many long runs, that develops a certain type of muscle fiber, but then you’re neglecting some other types of muscles,” my dad said. Cross training also helps reduce the chance of injury, something that makes many runners wary. My dad said that injuries can include muscle strains (overstretching), muscle tears, bursitis (where the sack of fluid near tendons swell), tendinitis, inflammation, stress fractures (the breakdown of bone), shin splints (where the tendon begins to lift the periosteum, the top level of the bone), and nerve irritation caused by swelling and repetitive pounding. 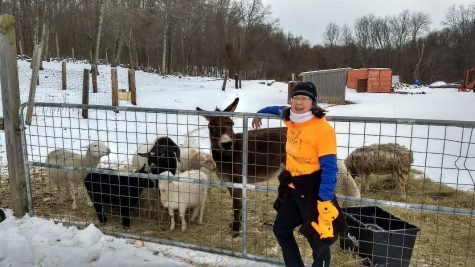 My mom says her cross training consists of Sunday strength training sessions at Resilience CrossFit in Hopkinton, along with shoveling snow, and skiing. “Right now my body is sore and my legs are sore because of our February skiing vacation. My body is in a state of sore,” she said. Training for a 26.2-mile run takes time and is a big commitment. Long runs, especially for a marathon, can take a few hours to complete. 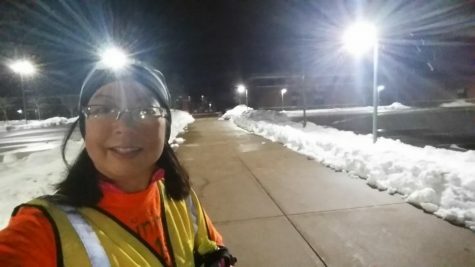 A few weeks ago my mom started running her long runs, sometimes late at night, that take many hours. “If you’re doing an eighteen or twenty-mile run, depending on your speed, you’re out there for three, almost four hours,” Markovich said. For Hanna, training was also a big commitment. 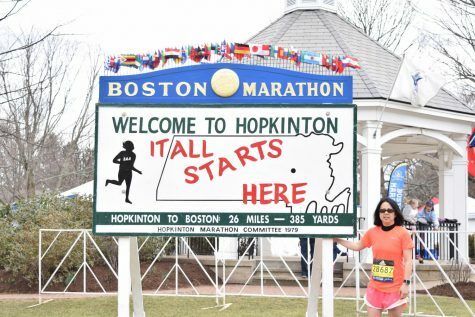 Denise Antaki standing in front of the “It All Starts Here Sign” two days before Marathon Monday. “I don’t think I took any time off, maybe a snow storm here or there, but for the most part I remember being pretty religious; waking up every morning and doing the training,” Hanna said. Beyond the time needed to run the miles required to build strength and lung capacity, time is also spent cross-training, figuring out the appropriate equipment needed, and planning the foods and drinks to be consumed before and during the marathon. “When you’re training for a marathon, one thing people may not appreciate or understand is just how much time training takes,” Markovich said. My mom has been experimenting with different foods, gels, and drinks to see which work best for her. She says she plans on using what the BAA provides along the route, including Gatorade Endurance gels and water. My dad said that nutrition mainly needs to be considered for long runs because that is when energy stores are depleted most. For these runs, runners need to have some sort of carbohydrate a few hours before and some simple sugar to supplement during their run, like Gatorade. Hydration is the key, though, because dehydration causes muscle cramps. “Your body can only convert so many calories of consumed food [like gels] when you’re running and you can only carry so much stored energy on your body. Compared to shorter runs, you have to be a little bit more strategic and thoughtful when planning your nutrition and hydration for a marathon,” Markovich said. During his training for Boston, Markovich noticed his body was getting tired and hungry more often. “What I was finding was that I was only consuming about 2,000 calories a day when I really needed to be up around 3,000 calories a day,” Markovich said. Along with foods and drinks, my mom has been experimenting with different equipment to figure out what works best for her. She has been talking and getting advice from past marathon runners in the Hopkinton Running Club, as well as PR Running, a running store. She will be getting new shoes to break in before her run. Equipment is important because a minor injury could be the cause of failing to finish a marathon, but these injuries can often be easily avoided if proper consideration is given to the equipment used. “You don’t want a small little blister to derail the race,” Hanna said. 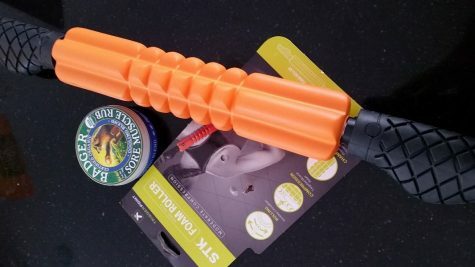 Sore muscle rub and a new muscle roller for training. One of the most important pieces of gear is the running shoes because when running a marathon, the feet take most of the beating. Pain in the feet can also derail training, leading to bigger consequences come marathon day. “If your running shoe is too small, you will get compression of your nerves and you start getting numbness, tingling, pain, or all of the above,” my dad said. Clothing must be considered for both training in the winter and running the marathon in the spring because managing body temperature is important. The body should not be too cold nor too hot. Plus, no one wants to be carrying unnecessary weight. “I remember having to go buy special gear to make sure that my body was staying warm,” Hanna said. Another important piece of gear is a running watch to help a runner learn what pace works best for them. 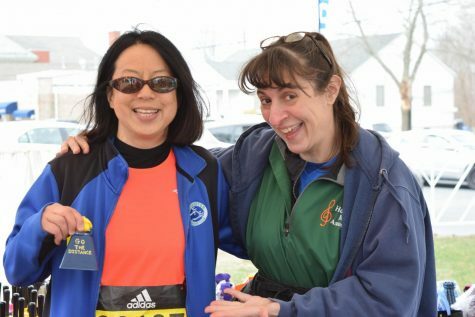 Denise Antaki (left) visiting Kathy Curry’s (right) booth at Hopkinton Common where she is selling bells to cheer the runners on. Curry was Antaki’s first donor. To run for a charity in the Boston Marathon, first, a runner must receive a bib from a charity, usually by means of a lottery. Then they have to raise at least $5,000, which has gone up over the years because of the increasing number of applicants. My mom’s fundraising goal is $5,500. 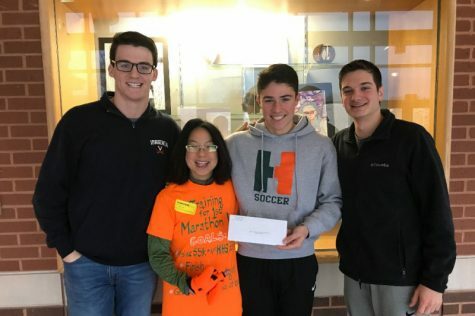 For big fundraisers, she has done Super Bowl Squares, she has sold Valentine’s and St. Patrick’s Day cards that were handmade by Emily Dembinski and Rachael Chen, as well as March Madness brackets. Our class officers have been trying to do as much fundraising with my mom as possible, mostly providing support and publicity. My mom has been at two class officer meetings, trying to brainstorm fundraising ideas. “She’s been awesome. She’s put in a lot of effort on her own which has made it a lot easier for us. We’re trying to help her in every way we can,” class president Nate Pucci said. According to Pucci, with past fundraising efforts, our class has enough money to cover the rest of our school year, including senior week activities, the boat cruise, and graduation gowns. The money my mom is raising will be going toward our senior class gifts. Denise Antaki posing with the banana she wants at the finish line. My mom is not out to break any records, but she is out to finish the race in daylight and within six hours, at which point the timing strips are pulled. She also wants the free banana that they hand out at the finish line. “Slow but steady. I think that’s how I’m going to finish the race,” she said. If you are going to see the marathon, you can spot her starting in corral 5, wave 4, with bib number 28687. Denise Antaki standing in front of her corral sign two days before her big run.